I’ll let you in on a little (personal) secret: ever since my IVF embryo transfer back in January, I have religiously worn a pink nail polish on my hands or feet. Call it superstitious, but I’m committed to maintaining this practice until Miss Savannah Faith arrives in October. 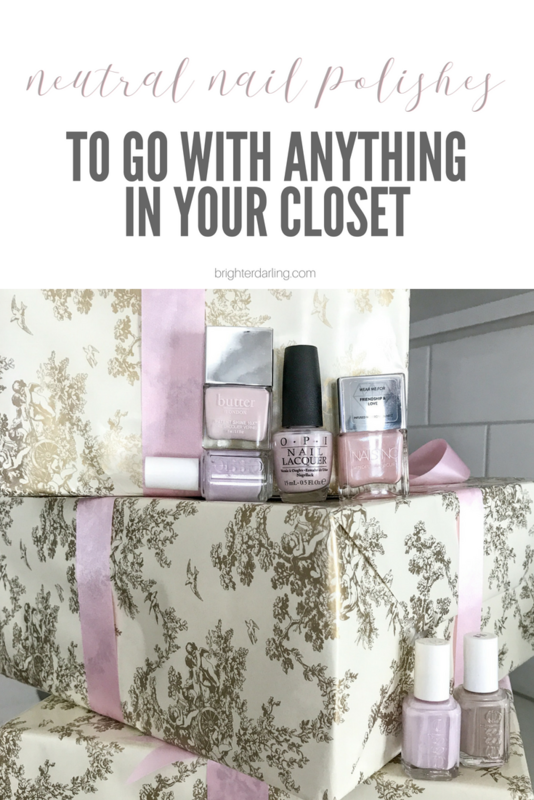 With that said, I’ve compiled 6 neutral nail polish colors (in mostly shades of pale pinks) that go with anything in your closet and keep your nails looking clean and pretty. Now, over the last few months, I have been trying Dip Powder nails, and although I love them (longer lasting and shinier than Gel Nails), I’m about to remove them to just give my natural nails a break. Because I still have them on, I can’t swatch these polish shades on my hands right now and I figured no one would want to see my feet because… well, awkward. But I’ll include swatches from other bloggers/Instagrammers for the shades I love when available. Twist and Twirl (swatch image here) is by far my most worn, favorite shade! It’s the one I wore during transfer and one I seem to always have on either my hands or feet. It’s an opaque, super pale almost white baby pink shade. A classic (and very popular) shade, Fiji (swatch, c/o Mateja’s Beauty Blog) is very similar to Twist and Twirl. Fiji actually pulls slightly more cool-toned and has an almost blue-based undertone to it when you see them next to each other. Fiji is a favorite summer shade for me and one I wear on my toes often. I picked up this shade when I read that Kim Kardashian wears this constantly as her go-to neutral nail polish and I can totally see why she likes Sand Tropez! Sand Tropez (swatch, c/o Temptalia’s Blog) a perfect light neutral tan shade that hides chips easily yet looks fresh and modern. Perfect for a mani for someone who tends to chip easily. 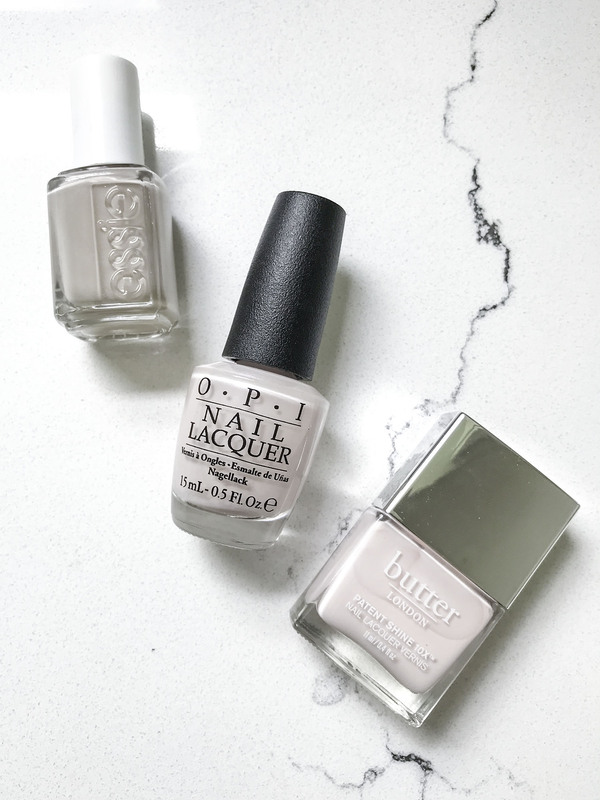 I love the OPI formula with their big, wide brushes… but besides that, Let Me Bayou A Drink (swatch image here) is a cross between Twist and Twirl and Sand Tropez… somewhere between a soft pale baby pink and a light beige. It also has a very soft, subtle shimmer if you like having a little sheen to your polish. I bought Go Ginza (swatch image here) a couple of years ago but it’s a great polish for any time of the year! It reminds me a lot of the Fiji formula – super opaque/pastel, but instead of being light pink this is a true light lavender. 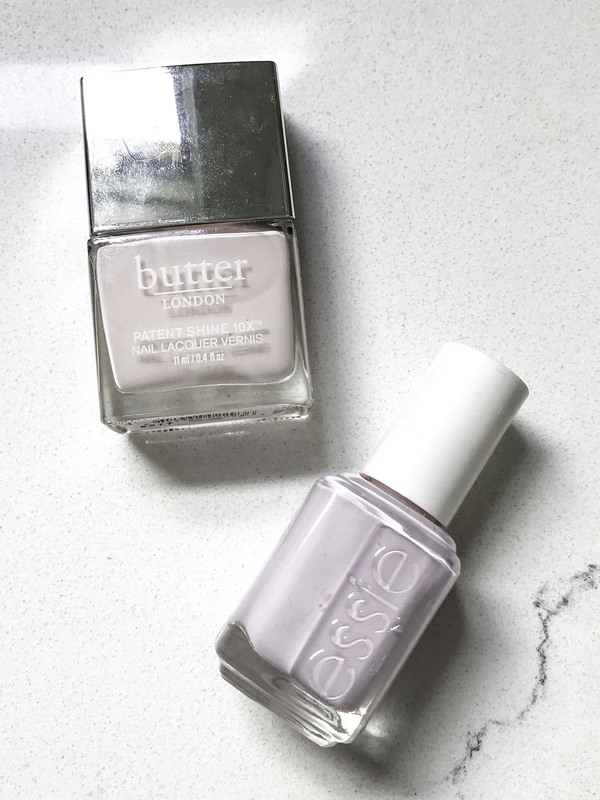 When I feel like being a little more sassy (which tends to only happen on my toe nails), I reach for Nails Inc Better Together* (swatch image here). It’s a super pale peach… can almost appear rose gold in certain lighting and on certain skin tone… with a silver/lilac iridescence and wears beautifully in the spring/summertime. 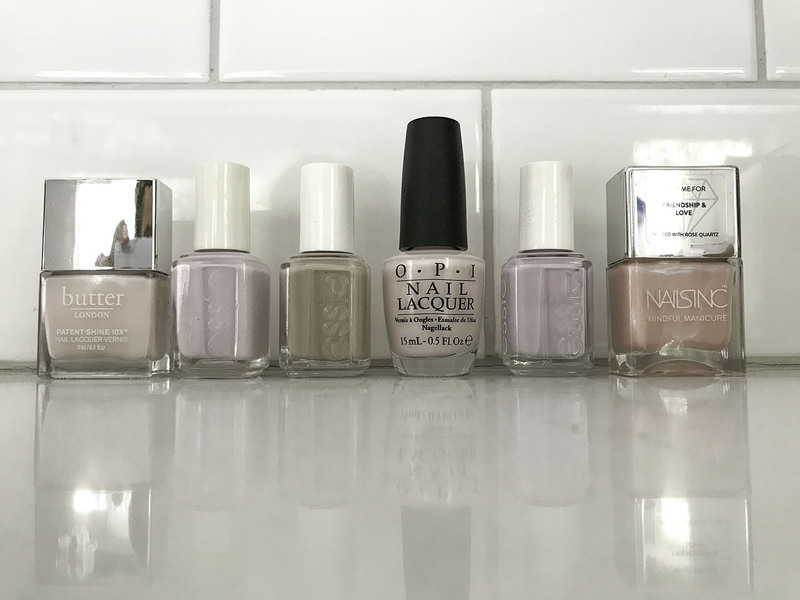 That wraps up my 6 neutral nail polish colors that go with anything! I hope you found this helpful. I always have friends ask me about easy to wear, light pinks and these are literally what I wear 98% of the year. 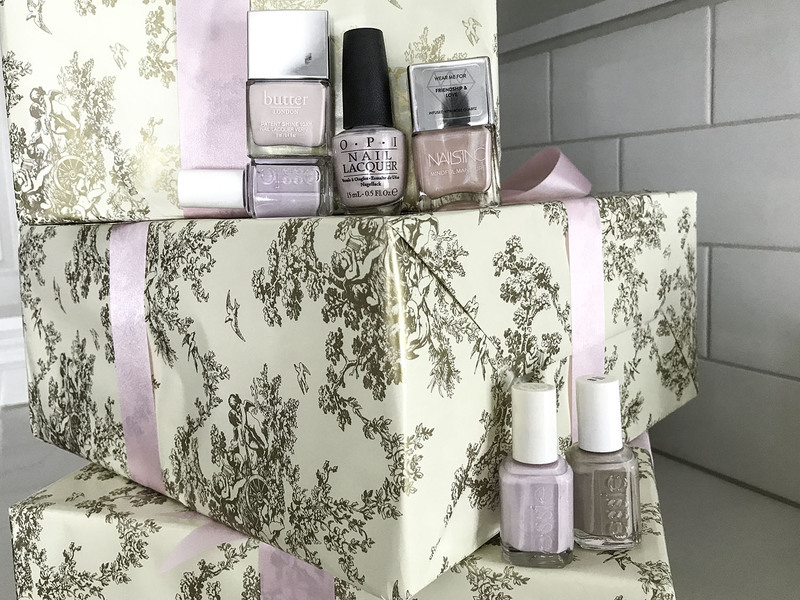 What are some of your favorite super pale, neutral nail polishes?